Mary Humble (center), her daughter Deirdre Hutchison (right), and her granddaughter Georgina Hutchison (left) all study at UMass Lowell. The idea of going back to school terrified 47-year-old Deirdre Hutchison. But the Andover resident didn’t have to look far to find inspiration. She has watched her 75-year-old mother, Mary Humble, get her education after dropping out of school at the tender age of 15 to help with her family’s business. Back in Bantry Bay, Ireland, Humble’s parents ran a general store, a guest house, and a pub. There, Humble played piano and accordion alongside her father on violin. Many decades later, she found herself back in the classroom. Humble has plugged away for more than a decade, first completing her GED, then earning her associate’s degree at Middlesex Community College, before enrolling at UMass Lowell. She has taken one or two classes a semester, occasionally derailed by health challenges. Doctors diagnosed Humble with stage four Non-Hodgkin’s lymphoma in 2001. They gave her around three years to live. She has outlived their predictions by nearly two decades. Seeing her mother’s progress over the years, Hutchison could no longer ignore her own wish to be in the classroom. So she, too, enrolled at UMass Lowell last year. 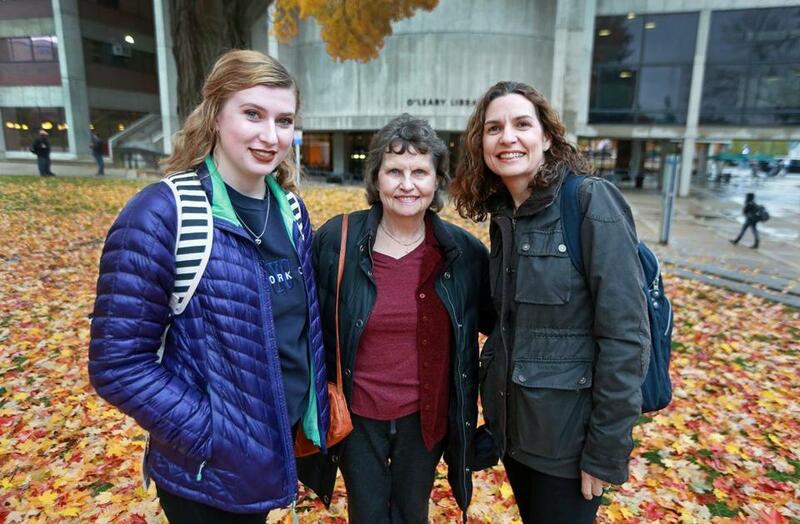 Now, college is a family affair for three generations of their family. This fall, Georgina Hutchison, 19 — Deirdre Hutchison’s daughter and Humble’s granddaughter — also started as a student at UMass Lowell, after transferring from a university in Pennsylvania. She wanted to be closer to her family. This spring, Humble will graduate with a degree in liberal arts. And, of course, Deirdre and Georgina, her fellow River Hawks, will be in the audience, cheering her on. Deirdre Hutchison is majoring in history with a minor in English. Georgina Hutchison is a criminal justice major. Though she lives in the dorms, she enjoys family dinners and family game nights often. Georgina has taken an American history class with her grandmother and has helped her mother with English papers. Deirdre, meanwhile, helps them both with math. Other students have helped Humble learn new technology, and she remains pleasantly surprised that she’s always treated like any other student in the room. “The very first day I walked in — when the reality hit and I’m physically inside in a room with youngsters young enough to be my kids or grandkids — I couldn’t help thinking, ‘oh my God. Have I gone crazy? What am I doing?’ ” Humble said. When the “kids” go on to graduate, Humble keeps in touch with them via text and e-mail. She has three classes left. Her daughter and granddaughter still have many more to go. Deirdre Hutchison is savoring each semester.